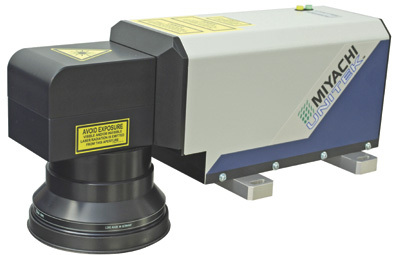 Miyachi Unitek Corp., Monrovia, CA, a manufacturer of welding equipment and laser-processing systems, announces the release of its 20-W single-mode fiber-laser marker, which yields a finer beam with a variety of advantages for marking, scribing and cutting applications. The new LMF 2000-SM laser marker can produce fine lines and increases the mark working area compared to other models, says the company. It also has an increased depth of focus for marking on curved surfaces. The new model proves ideal for the scribing and cutting a wide variety of materials, including alumina, silicon, copper and aluminum foils. The firm developed the machine in response to customer demand for fine marking (less than 30 microns) and micromachining applications. Featuring a compact, air-cooled, robust design, the LMF series features PC, touchscreen, standalone or pendant operation, rotary and XYZ motion options, and a variety of marking software alternatives.